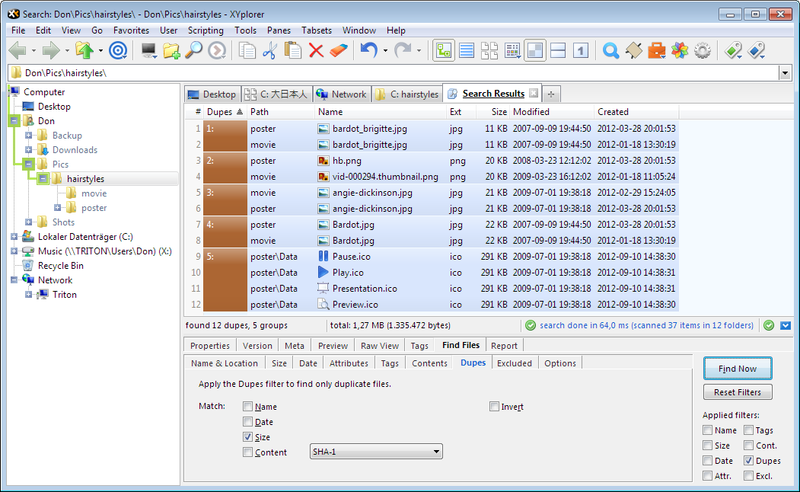 Duplicate File Finder. 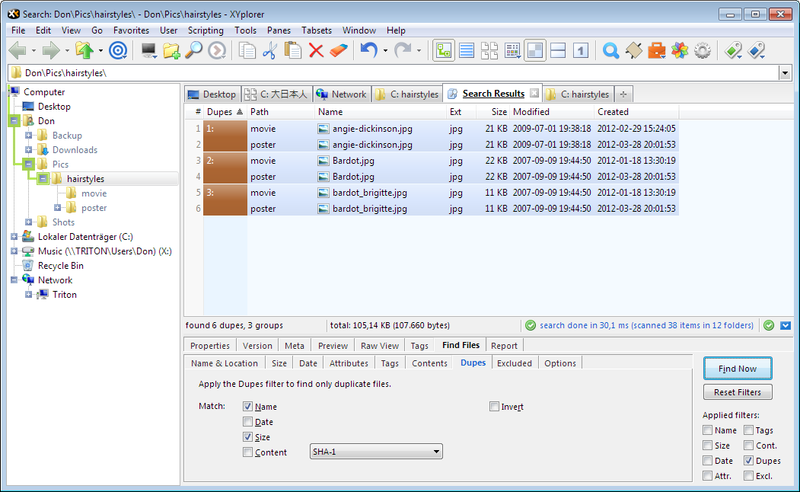 Finds duplicate files by name, date, size and/or content in any location. 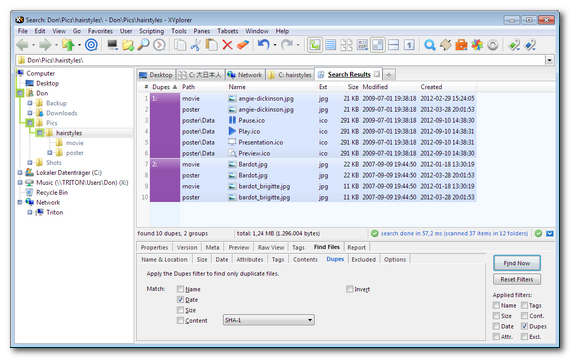 Spotting duplicates, especially those by content, can be useful for freeing up storage space. 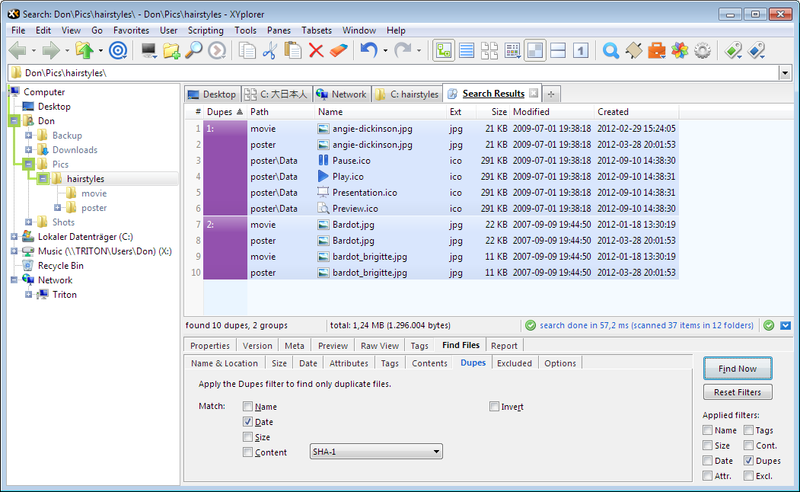 XYplorer's Duplicate File Finder is implemented as filter Dupes in the Find Files tab. If the filter is active then only duplicate files are listed in the search results, i.e. files that have one or more duplicates in the searched location(s). What counts as a "duplicate" can be defined in the Dupes tab: It's either match by Name, or Date (modified), or Size, or Content, or any combination of these. For Content you can further define the method of comparison: The choices go from MD5 (fastest but least reliable) via SHA-1, SHA-256, SHA-512, to Byte-to-byte (slow but most reliable). Generally, SHA-1 is thought to be reliable enough for real world usage and hence it is also the factory default. Tick the Invert option to find all singular/unique files; quite useful when comparing two folders that should be in sync. 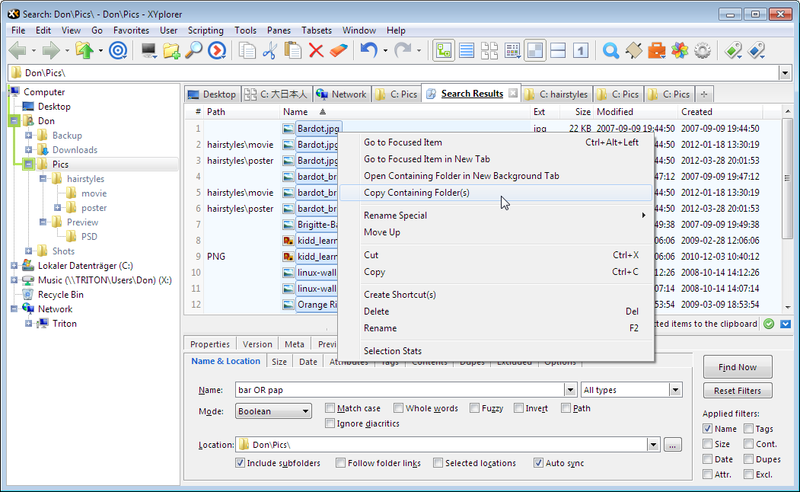 The Dupes filter is fully integrated with the XYplorer Find Files module and can be combined with all other search filters. The Dupes filter finds only files, no folders. Equally the Invert option will return only singular files. Right-clicking the Dupes column when the list is sorted by this column pops a special context menu with two commands for selecting items based on the dupe groups: Select the First Item in Each Group, Select the Non-First Items in Each Group. Of course, checking for dupes by content can take a lot of time. 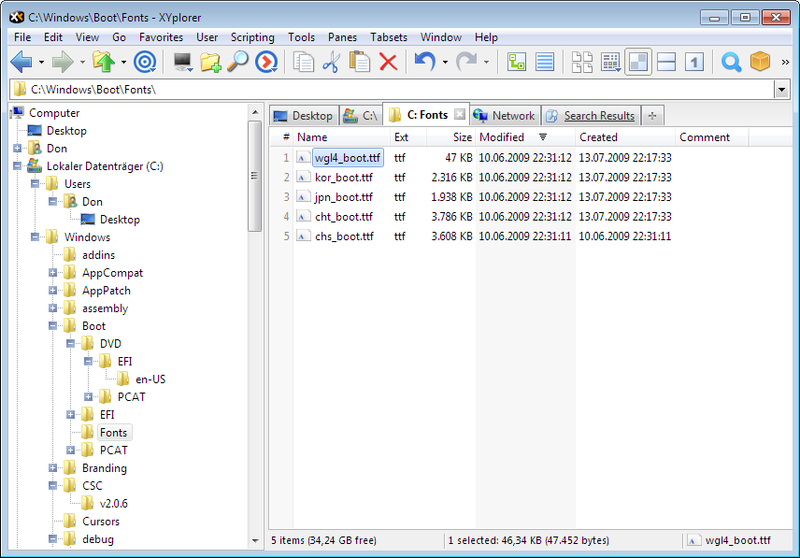 Still XYplorer is pretty fast here due to some smart logic. The bottleneck, however, is the hard drive read speed. Search results caching is supported by dupes searches. But always remember that caches can get stale: It might be that files marked as dupes are not dupes anymore. Tree Path Tracing™ is a revolutionary new Tree style you won't find anywhere else. Turn it on in menu Tools | Customize Tree | Tree Path Tracing to highlight the current path in the Tree. It's a visual aid to always know your place in the folder tree, without even consciously looking at the tree. The highlight color can be customized in Configuration | Colors & Styles | Tree Path Tracing. Note that there is also a toolbar button (pictured here on the left) to quickly toggle it on and off. The button's right-click menu offers all tree styles. PSD Previews. More good news for photographers: Enhanced support for PSD Preview, Thumbnails, and Mouse Down Blow Up. Whereas previous versions of XYplorer only showed the embedded thumbnails of PSD files, now a real full size preview is supported, including full size Mouse Down Blow Up. Note that a Codec for PSD, e.g. the FastPictureViewer Codec Pack, needs to be installed on the system (it is not included in XYplorer). Rotate. Now you can rotate the Floating and Full Screen Preview. Works for all previewed file types, even for RAW images, PSD, TGA, PDF, and video thumbs. Simply press L for "Rotate Left" and R for "Rotate Right" to rotate the preview in 90° steps. Of course, the original image itself is not modified. Note that pixel-exact Mouse Down Blow Up works just fine in rotated previews. Judy Garland, rotated by 90° clockwise. XYplorer 11.60.0100 has been released on 18-Sep-2012. It just has some bug fixes. Copy Containing Folders. 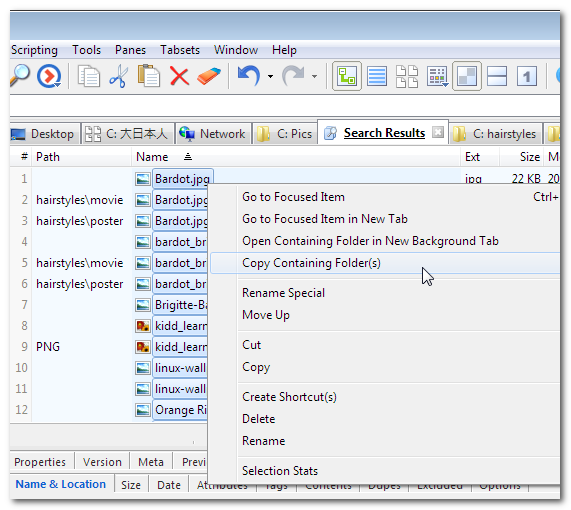 The right-click menu of items in Search Results and Branch View got a fabulous new command to copy the containing folders of all selected items to the clipboard. 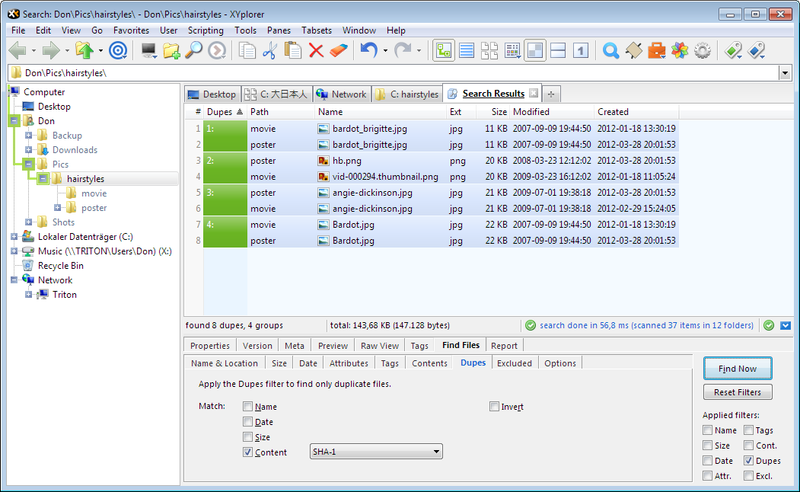 Usage: Now you can use Find Files to identify folders by their contents (e.g. 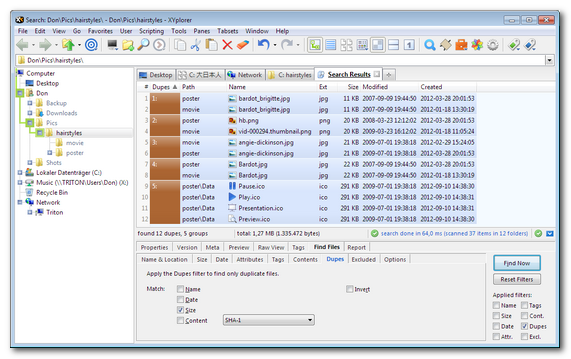 by the name, type, size or contents of the files within those folders), and then copy those folders for further processing. A very useful enhancement. 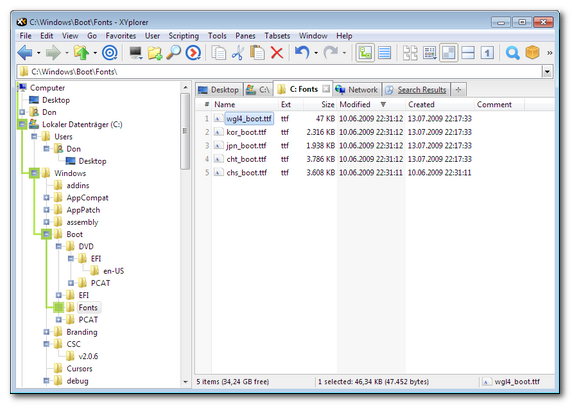 E.g., you can find all folders that contain files containing the word "Las Vegas". 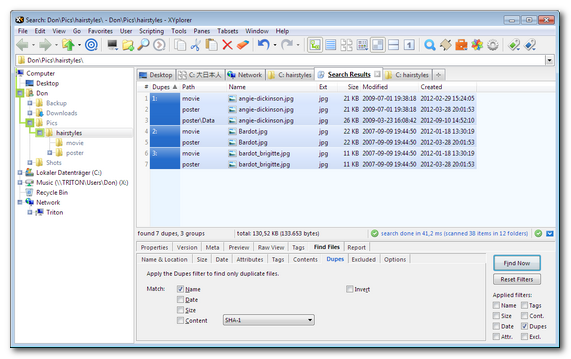 The containing folders are the direct parent folders. If the containing folder is a drive it will NOT be copied. If more than one item is selected the list of containing folders is silently cleared from duplicate and folders contained in other folders in the list before it is copied to the clipboard. So it will not be unusual that less folders are copied than items are selected.